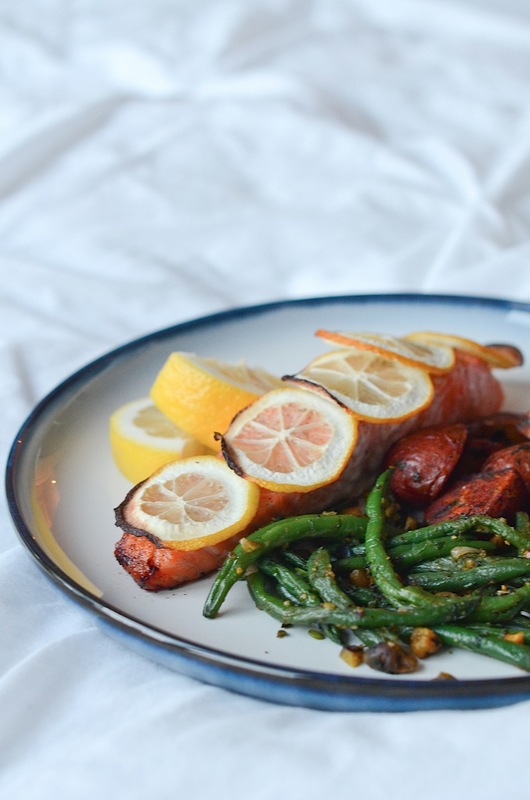 This Lemon Baked Salmon Recipe has been one of my favorite clean eating entrées to make during the work week. After a long day of work and then working out, cooking something healthy is sometimes the last thing on my mind. And that’s if I can convince myself to cook. But this is so easy and uses so few ingredients, it’s a no brainer. 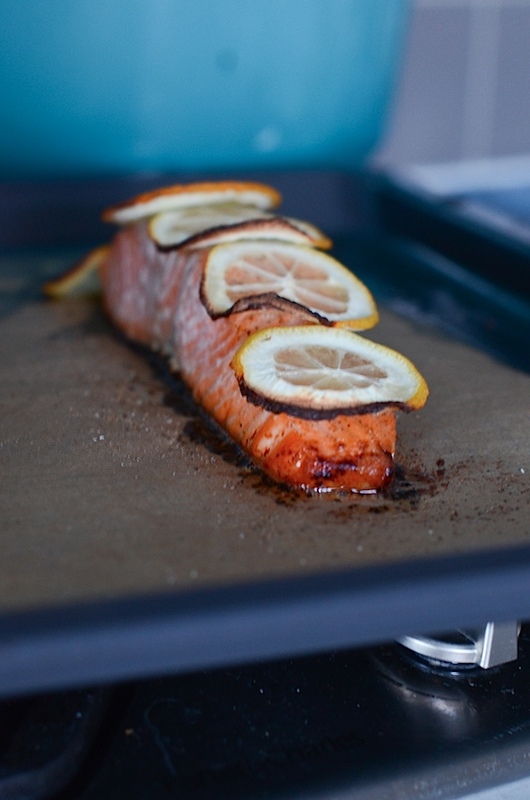 One of the reasons I like this Lemon Baked Salmon Recipe after a work / workout day is because it’s so easy to cook. It takes about 5 minutes or less to prep, and it bakes in the oven while I shower and get ready for the night. No extra attention needed from me. I brush the salmon with olive oil. Top it with salt and pepper. You can add garlic powder or salt for a little more flavor. 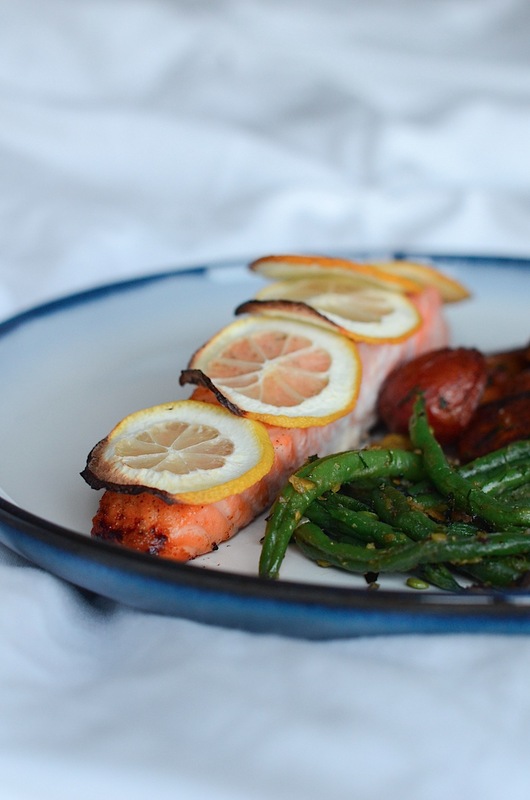 Top the salmon with lemon slices. That’s it. Bake away and then enjoy! Bonus tip: get pre-prepped sides that you can warm in the oven. Add them to the baking sheet for the last few minutes of cooking, and your whole meal will be ready at the same time. It’s healthy. It’s easy. And it’s delicious. 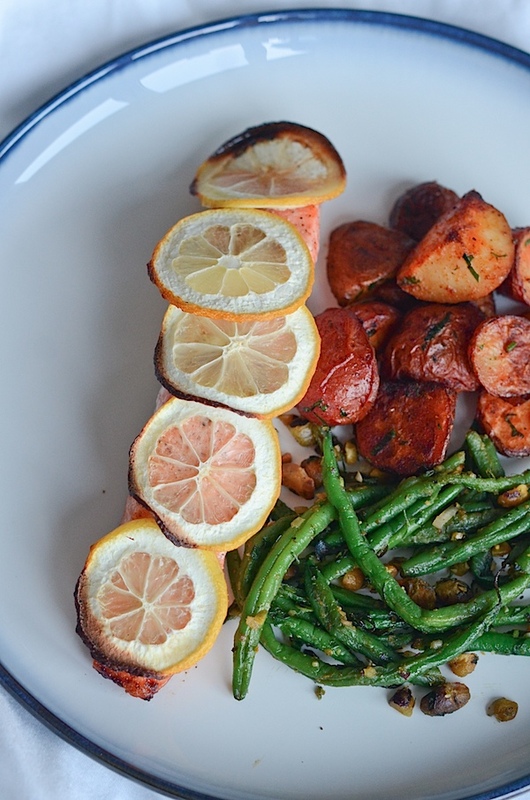 Serve it with extra lemon wedges to squeeze on top for even more zesty flavor. Bonus tip: You can also use any extra lemon pieces to flavor your water. 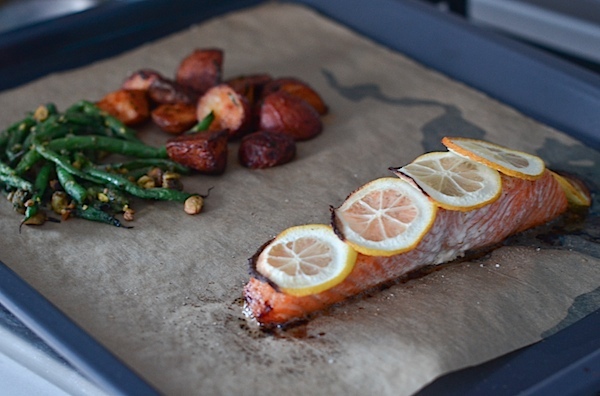 This Lemon Baked Salmon is as delicious as it is easy. Using only a handful of ingredients, you can have this ready while you get ready for the evening. 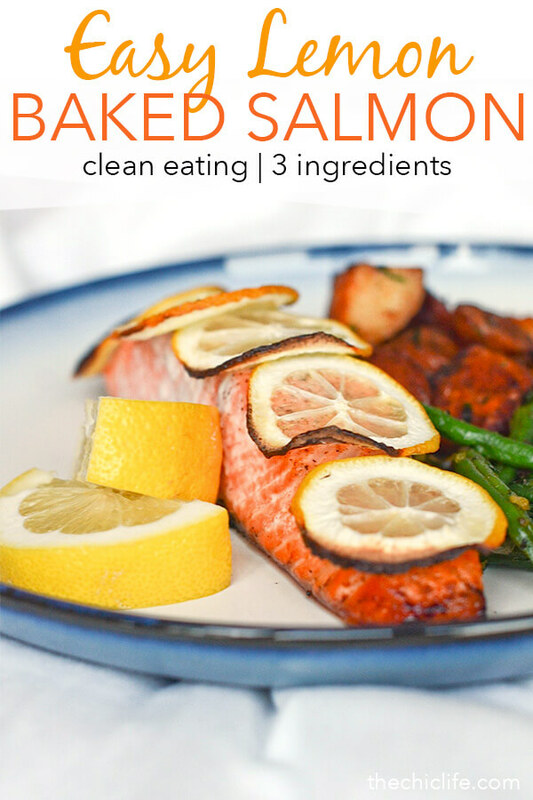 Brush the salmon filet top and sides with olive oil. Top with a sprinkle of salt and pepper. Add a sprinkle of garlic powder, if using. 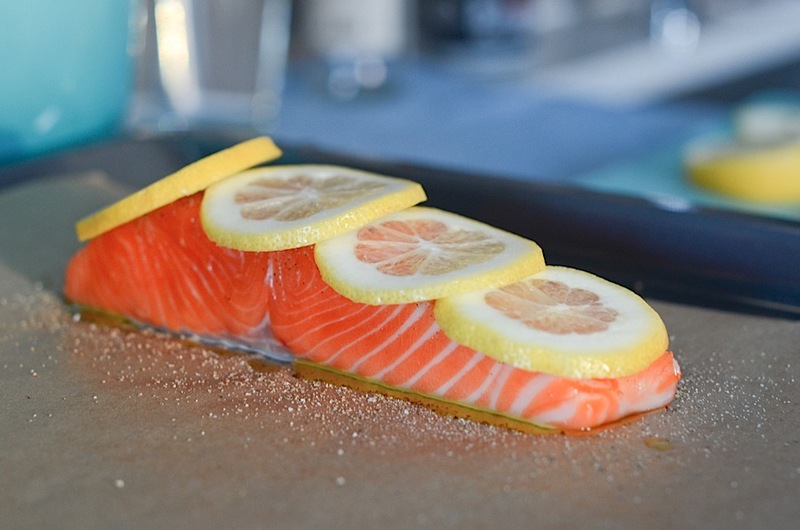 Slice enough thin lemon slices to cover salmon. Cut the rest of the lemon for wedges for serving or to add to your water. Top the salmon with lemon slices. Bake until cooked through to your liking. I usually bake mine for about 10 minutes per 1 inch (height) of salmon. Recipe easily multiplies if you want to serve more than one. 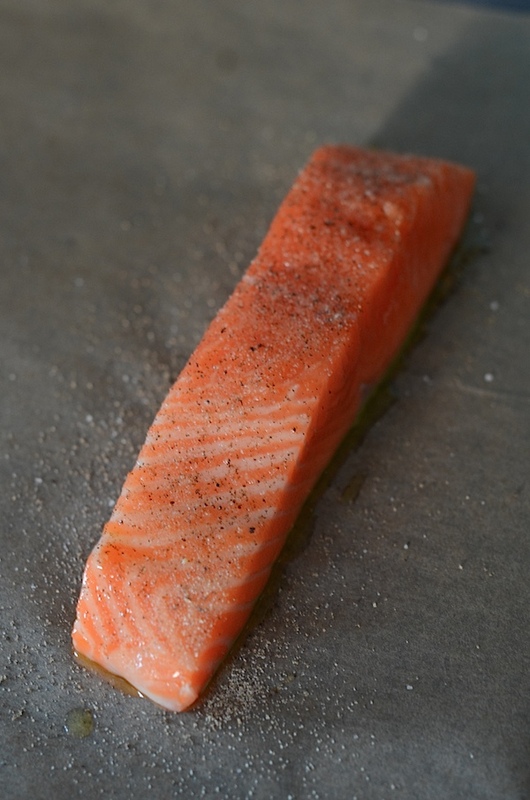 If you’re skittish about your fish being cooked through, like me, then look for a sushi grade salmon. I still cook mine well done, but I like the peace of mind. 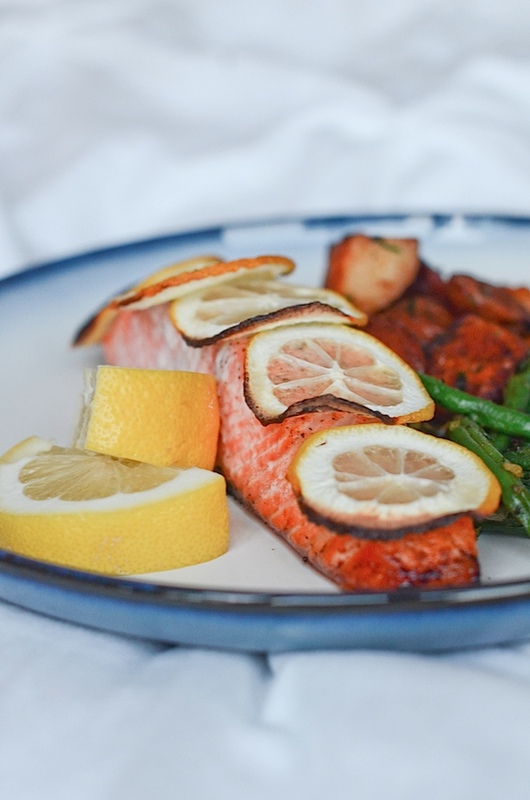 Hope you enjoy this Lemon Baked Salmon recipe. Click here to check out even more healthy recipes.